Yesterday, I posted about how I’d finished Round One of editing (wooh!). The kicker is, I went through the last forty pages in a single day. I was on a roll. And hey, they day wasn’t even over yet! Why not go right to Round Two? I picked up my manuscript, booted up the computer, and got ready to start recording my corrections from the beginning. And I was immediately confronted with that sentence. That parenthetical, periodical travesty that had made it this far because I couldn’t figure out how to de-convolute it without ruining some, or all, of its effect. Maybe, later on in the book, I could have let it slide…. but it’s in the first paragraph. The first paragraph of an indie novel. I don’t know about you, but I make decisions on self-published books based on that first paragraph. If the author can’t convince me in that space of time that they have a competent control of the english language, I’m out. So this is where I realized what I’m really up against in Round Two. I’m up against all the things that can’t be solved quickly, and without considerable thought. I hadn’t rewritten the sentence with my red pen; I had only written “still not sure.” Nope, not sure at all. Last night, I closed my computer and slunk off to bed. I thought of that sentence while starting my day this morning, and mulled it over. I asked myself questions like, “What am I trying to achieve with this sentence? Is it more important for it to be periodical, or lyrical? What is another way to convey this information?” Then when I got back to the computer, I finally did the work. I tried out several different things, and crafted a new sentence that has the dramatic effect I want (I hope) without sacrificing prose and readability. I’ve probably spent over an hour on that single sentence—and this is how every little thing is going to be from here on out. Here’s another example. After she’d read most of the prototype, Lady Higg told me, “Nathaniel sighs a lot.” I said, “Huh, I guess he does.” It’s not really a problem, and it sort of makes sense with his character, and how he’s feeling in the first few pages. To be safe, though, I counted the sighs in red ink. Today, when I realized the “Nathaniel sighed” I’d marked as number one was actually his second sigh in four pages, I had to look a little closer. The line was, “Nathaniel sighed inwardly.” Well, what does that really mean? What is the feeling I’m trying to convey here? Again, I tried a few different things, and finally arrived on, “Nathaniel suppressed a desire to beat his head against the steering wheel.” I think this provides a much more concrete image, is much more interesting, and conveys more of his frustration and melancholy than the previous, lazy line where he sighs yet again. One more story. Back in April, as graduation and the Senior Show loomed closer, I had to write a Personal Statement to display next to the Wanderlust prototype and illustrations that made up my portion of the Senior Exhibition. The statement had to be approved by my advisor. 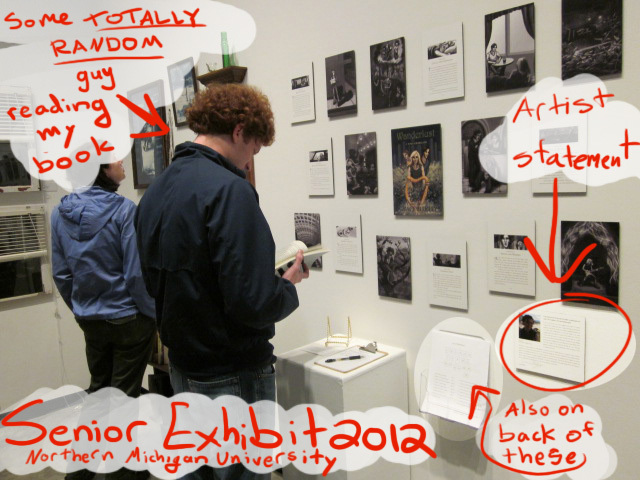 When I went to see him, I was all like, “BAM, I work at the Writing Center, yo, how’s that for an artist statement? !” Okay, I wasn’t actually like that at all, but the point is I’d seen how bad Artist Statements can get, and I was feeling a little complacent about mine. My advisor said, “Okay. But when you say this, what do you mean? Can you find a way to actually describe that? Can you be more specific?” I may have gone away grumbling, but I knew he was right. It was the same thing I would have asked from anyone at the Writing Center, even though it’s so hard to be specific when you write about abstract things. I worked on my statement, I found a way to say what I meant, I got more specific, and I sent it back to him. He said, “Not bad,” and asked for more. We went back and forth several times after that, and the end result was an artist statement that was so much better than my complacent, and lazy, first effort. This story’s connection to my current endeavor is pretty clear. In editing Wanderlust, now is the time to demand more from myself, and stop settling for complacency. It’s time to mull things over, to spend a day on a single sentence if necessary, and to stop writing lazy when, with a little work, I have so much more to give. Yesterday and todays’ rapid-fire posts have been all about the nitty-gritty of the writing process. I’ll try to mix it up later this week, but tell me: Are you interested in hearing more about harps and Celtic mythology? Should I post more art? How about book reviews? Would you like to see more nitty–gritty writing posts in the future? It’s nice to know my Nathaniel sighs a lot comment was taken to heart. 😉 I can’t wait to read the new draft when you get it all ready for outside eyes! Also, pretty neat that some totally random guy was reading your book. I know I’VE never seen him before in my life. Good luck with that sentence. I’m always around if you need to bounce ideas off someone. I would enjoy more rapid-fire posts, especially about your growth spurts as a writer. Good luck with the remainder of your edit.